One of my ultimate comfort foods – you know the kind of food that makes you feel all warm and happy like you do when you’re wrapped up in a fluffy blanket right out of the dryer – is cinnamon raisin toast with a healthy layer of peanut butter. The nutrition of my regular cinnamon toast and peanut butter is… not quite up to par, though there are worse things, so as I was experimenting with my new favorite breakfast of Overnight Oats. 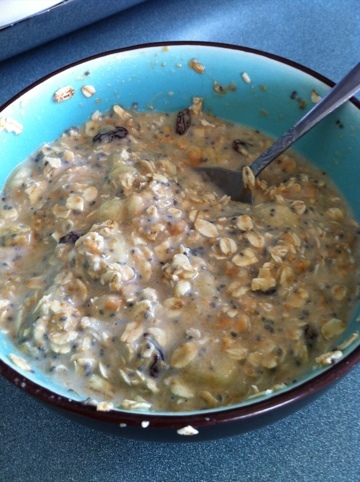 I discovered something amazing… I could make overnight oats that tastes just like my delicious comfort food! I stirred it all up, to the disgust of my onlooking roommate who insisted it looked like poo, and put it in the fridge overnight and my breakfast this morning was magic! Plus I was full for the entire morning (which is rare for me as I’m usually fantasizing about my lunch or running to my coworker’s office for a piece of dark chocolate by 11am. *Note: You can make this in the morning and pop it in the microwave for about a minute if you aren’t a fan of cold oats. I’m really enjoying testing out various twists on the basic recipe for vegan overnight oats (the original recipe for overnight oats actually used yogurt) and will keep trying things out and sharing the successes. What’s your favorite Overnight Oats recipe/creation? This recipe looks amazing! 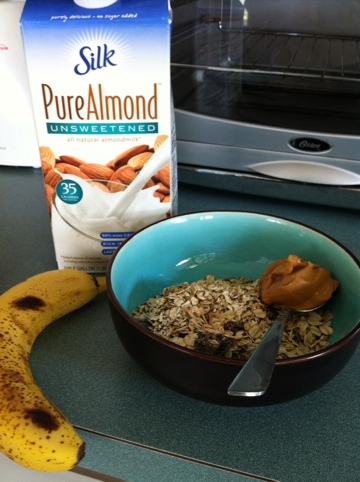 I will probably try it with one substitution (regular old cow’s skim milk instead of almond). Just a personal preference, but the rest sounds fantastic – can’t wait to make it for myself! !